We believe your home is your sanctuary and that a good night’s sleep begins with your sheets. As experts in the art of linens, the team at A. HOME can help you create the bed and bath of your dreams. We offer a comprehensive selection of the highest quality bedding and bath collections, plus near infinite options for customization. From classic to modern and from feminine to tailored, you’ll enjoy the ultimate in comfort and a style that’s all your own. Matouk Bespoke - Elevate your home with the incredible quality of personalized Matouk Bespoke bedding and bath linens. We’re proud to offer endless possibilities for styling and detailing this line - far beyond what’s available at other retail stores or online. Atelier - Our Atelier custom linens for the home are exquisitely crafted in the USA with the world’s finest fabrics. Their chic and timeless style includes appliqué, embroidery and monograms - many of our own A. HOME design. Julia B. Couture - We are New Jersey’s exclusive retailer of Julia B. Couture, the best in handmade artistry. You can select from a myriad of designs, colors, monograms and techniques to style your bed beautifully. We want you to get excited for bed! Our Studio Linen collection offers the highest quality linen pieces for your home, custom made just for you. Whether you’re looking for drapery panels, table skirts, benches or pillows, you’re sure to fall in love with their ease, sophistication and abundant custom design options. DRAPERY PANELS - Panels are 100% cotton linen, and made to order in the USA. They are available in 13 styles and 7 header options, plus all panels have double blind stitched bottom and side hems, corner weights and 100% cotton sateen lining or interlining. See our Line Sheet to learn more. TABLE SKIRTS - Our Linen skirted tables are ideal in endless places in the home, from night stands and side tables to entry, living or dining room consoles. 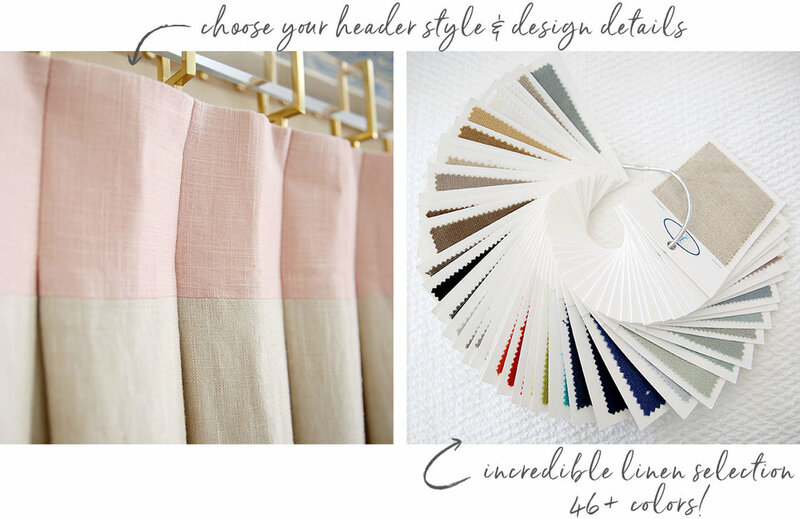 Custom linen detail options include box pleats, borders, color block frames and fretwork. Our table bases are also available for purchase in 30” or 34” high styles in round, octagonal or rectangular. See our Line Sheet to learn more. BENCHES - Our upholstered leg benches are as chic and versatile as they come. Available in 2 bench sizes (54" x 18" x 18" or 40" x 18" x 18") or as an ottoman (18" x 18" x 18"). You can choose from our gorgeous linen and decadent velvet fabrics and from options like piping or single and double rows of nailhead trim. Both available with or without skirt. See our Line Sheet to learn more. PILLOWS - Bring comfort to every room in your home with our custom made pillows, all expertly tailored by highly skilled artisans. Pillows are made with feather-down fill and zipper closures and are available in sizes 22" x 22” or 14" x 20". Fabrics and finishes come in a wide array of options including linen, velvet, fretwork, tapes and appliqué. After years of working with the many products from Vanguard Furniture, we've whittled down their extensive selection and created our unique CORE Upholstery collection. It's comprised of what we consider to be Vanguard's key pieces, the ones we like to call, POWERHOUSE PIECES FOR YOUR HOME. These are our best sellers and our customers' favorites; styles that work in any room in your home and blend traditional with transitional. Plus, each beautifully built sofa, armchair, bench and ottoman is customizable to perfectly fit your own aesthetic and space. CORE Upholstery is proudly made in the USA using sustainable forestry and environmentally-conscious practices. Each piece has a lifetime warranty on its frame, springs, and seat cushions (under normal use); and is available in multiple fabric, size and style variations. See our line sheet to learn more. CORE 4 is a specially priced selection of sofas, sectionals and loveseats from our CORE Upholstery collection by Vanguard Furniture that's simple-to-order and offers big savings! Simply choose your seat depth (Traditional or Grand), fabric (from our CORE swatch set) and foot/leg preference and enjoy 40% off MSRP! See our line sheet to learn more, or click here for style and pricing options. Put a fresh twist on traditional rattan furniture with our paint-to-order bamboo furniture collection. Inspired by British and Asian antiques and reinterpreted for everyday use, these fine rattan pieces come in more than 24 colors and finishes, as well as custom colors to match your exact look. Our collection includes arm and side chairs, counter and bar stools, a wingback chair, bench and mirrors. Call or email the A. HOME team for more information, or stop by our Summit, New Jersey boutique to begin your custom design process!